Egypt dragged to war in Yemen? Egyptian President Abdel-Fattah El-Sisi visited Cairo’s military academy on Friday, days after a bomb attack killed two army cadets in the northern governorate of Kafr El-Sheikh. On Wednesday, an IED exploded near a soccer stadium, where a number of students of the military academy were waiting for a school bus to transport them back to Cairo. Six civilians were also injured in the attack. In his speech, El-Sisi said that the number of terrorist attacks, which he said had increased recently, were "cowardly acts" and that those who led the operation have no other means at their disposal. "Our determination will remain the same and our first priority is the safety of Egyptians and the security of our country," he said. The president also extended his condolences for the deaths of the two cadets. Attacks on police and army personnel have been recurrent since the ouster of Islamist president Mohamed Morsi in summer 2013. El-Sisi also spoke about military operations in Yemen, denying media reports that Egypt had dispatched ground troops to support the Saudi-led Decisive Storm campaign which has been targeting Houthi rebels since May. 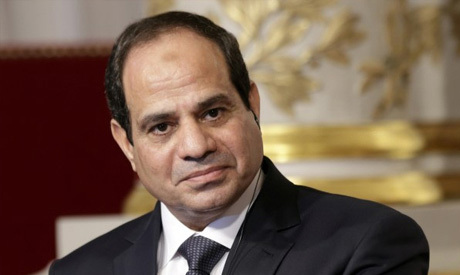 El-Sisi said that Egypt had only deployed air and naval forces to the conflict. El-Sisi also stressed Egypt's keenness for a political solution in Yemen. Houthi fighters have taken over several cities in Yemen, including the capital Sanaa, a development which prompted Saudi Arabia and regional allies in late March to carry out airstrikes against them to halt their advance. Saudi-led warplanes have pounded hundreds of rebels according to reports. UN chief Ban Ki-moon has called for an immediate ceasefire. The Egyptian president also spoke on the importance of the upcoming Egyptian parliament, saying that it will play a crucial role in uniting all the state's institutions "to protect the Egyptian state." The long-delayed parliamentary elections – the first since the ouster of Mohamed Morsi – were scheduled to begin in March, but had to be delayed after the Supreme Constitutional Court ruled two key electoral laws to be unconstitutional. The laws are in the process of being amended by the cabinet, although a new timetable for the polls has yet to be announced.